An abundance of brilliant minds, pairs of stilettos, and 2014’s latest fashion trends greeted New York University’s campus to kick off the New Year on January 14th and 15th. 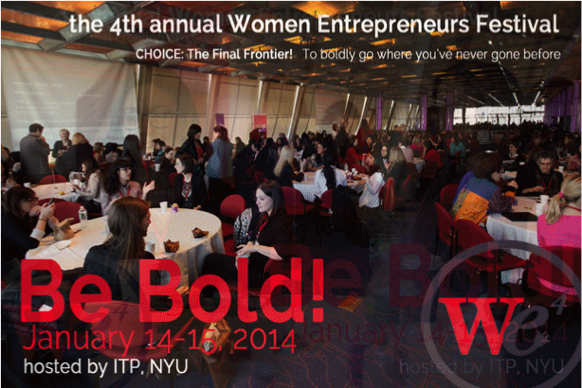 Hundreds of women gathered at the 4th Women Entrepreneurs (WE) Festival, hosted by NYU’s ITP. My Kinvolved Co-founder, Miriam, and I had the opportunity to participate in the celebratory affair. The WE Festival was packed with networking, education, and inspiration. 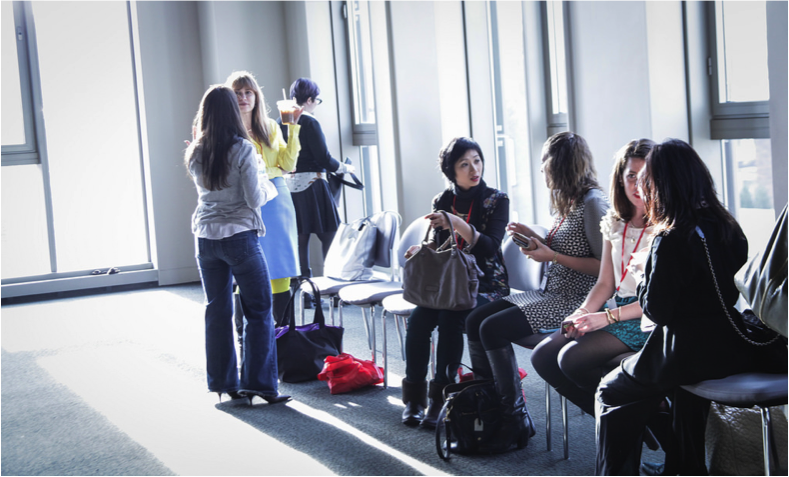 These series of events have pushed me reflect on what it means to be a female entrepreneur. “Let yourself be scared to death. Wild happiness lives on the other side of your own fear.” Lauren Zander, Co-founder and Chairman of the Handel Group, confidently said this during her opening remarks on Saturday morning alongside Joanne Wilson. Lauren pushed us to look at fear straight in the face, and acknowledge that failure can be one of the most brilliant things we will experience as entrepreneurs. Failure is accompanied by many lessons that will make us smarter, work harder, and be better at what we do. I have certainly experienced failure as I have started by own venture, but I more importantly have learned that hard work, grit, and passion can triumph any setback or defeat. “Let the little failures fuel you.” One of the few, yet fearless women technology founders, Crystal Hutter, CEO of Edmodo, shared this as advice when I asked her what she wished she would have known ten years ago. Crystal spoke to the ups and downs we all face as entrepreneurs, but encouraged the women in the audience to do whatever it takes to keep moving forward. She advised we turn frustrations and failures into positive energy. “Women have 12 percent more prefrontal cortex than men. Women are more intuitive, but we do not always trust our intuition.” Geraldine Layborne, serial entrepreneur, Founder of Oxygen Media, first President of Nickelodeon and the President of Disney/ABC Cable Network, gave us a brief biology lesson about how our brains differ from men’s. The prefrontal cortex enables us to process multiple thoughts at once, and is the connective tissue that allows us to talk about our business plans, plans for Friday night, and plans to take over the world all in the same conversation. This portion of our brain explains why women make great strategic and intuitive thinkers. Research proves that women tend to combine intuitive and logical thinking more seamlessly than men, a quality that is integral to leading a business. Yet, Geraldine questioned why it has taken so long for women to be at the forefront of business decisions, and why women sometimes counterintuitvely fail to trust their intuition. The science and facts are on our side, ladies. Let’s keep pushing the needle forward. “Often women put up a guard that is off-putting. I say free love.” Geraldine stressed that we women need to be better at self-promotion and more supportive of our female colleagues. The best way to advance our role as women in the entrepreneurial arena is to do these two things. As Geraldine advanced in her career, she recognized herself as a guardian to make sure women around her were heard. If you are not comfortable promoting your company or yourself, share accolades for your business partner, or the woman you just met sitting next to you. She will appreciate it more than you know. “Forge your own path to make things easier for other women.” During a Q&A session of Anne-Marie Slaughter’s opening keynote, my friend and fellow entrepreneur, Michele Spiezia, expressed how she wants to give back more to the WE community. She said she was not quite sure how to do this, since her early-stage venture requires so much of her limited time. Anne-Marie gave her the task to “just succeed.” “Just succeeding” is no small thing to do. However, by the pure nature of more women succeeding and building their own empires today, we are making the lives of women coming after us that much easier tomorrow. As we make the entrepreneurial playing field more diverse, we open up so many invaluable opportunities to create innovative solutions to our world’s most complex problems. We live in a fortunate and opportune time to make our mark as entreprenuers, to build things that will make the world a better place, and to afford opportunities to women, and men, that will come after us. The Festival showcased this, and exhibited that 2014 will in fact be a break out year for women entrepreneurs. Contributor: Alexandra Meis, Co-founder, Kinvolved, alexandra@kinvolved.com. Follow Alex on twitter @alexedtech and @kinvolved. Previous PostBalanced Leadership: Can lifestyle and gender balance at and outside of work lead to sustainability?